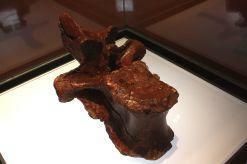 Vertebra from the newly discovered dinosaur species Aardonyx celestea. 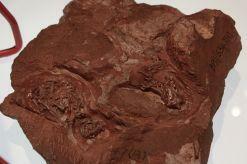 This fossil has helped scientists to learn more about how early dinosaurs walked. 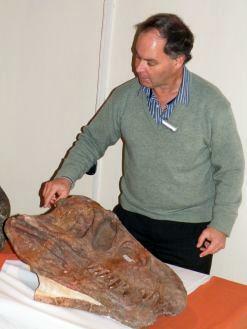 Prof Bruce Rubidge shows visitors a large crocodile-like reptile skull, Erythrosuchus, believed to be one of the most distant ancestors of dinosaurs. The large hand of a Gorgonopsian clearly illustrates the hunting capabilities of these flesh-eating mammal-like reptiles. Massospondylus eggs and fossiled embryo. The fossils on show reveal important information about the development of mammal-like reptiles, which over hundreds of millions of years gradually evolved into mammals. A rare collection of original fossils that evolved over a period of 120-million years, dating back even further than the discovery of early hominids, is on display at Maropeng in the Cradle of Humankind. The new exhibition is a collaboration between Maropeng and the Bernard Price Institute (BPI) for Palaeontological Research at Wits University, to celebrate the university’s 90th anniversary. The fossils on display, which offer an extraordinary glimpse into what came before dinosaurs, are a small selection of pieces from the institute’s prized original fossil collection. At a glance the items on display might look like nothing more than pieces of rock, but a closer inspection reveals that they are palaeontological finds with great significance. These fossils are helping scientists piece together the puzzle of human and mammal evolution. Speaking at the opening of the exhibition, BPI director Prof Bruce Rubidge explained that the fossils on show reveal important information about the development of mammal-like reptiles, which over hundreds of millions of years gradually evolved into mammals. “All fossils displayed here are our ancestors,” says Rubidge. What scientists saw in their study of these fossils is that over time our primitive reptilian ancestors gradually acquired more mammal-like features. “This means we can trace the entire evolutionary development of mammals,” he explains. Rubidge explains that about 300-million years ago, when terrestrial ecosystems started to develop, the only animals with backbones were fish and amphibians. The Karoo region records a long period of geological ancestry of three groups of reptiles that gave rise to tortoises, dinosaurs, lizards, snakes and small mammals. “This whole evolution is encapsulated in these rocks in the Karoo,” he says. This collection of fossils is even more noteworthy because of its origins in rocks in the Karoo region, dating back 180- to 300-million years ago. “What is amazing about South Africa’s Karoo rock is that it is an almost continuous sedimentary record of palaeontological history for a period of 120-million years,” explains Rubidge. Visitors can see parts of Aardonyx, a vegetarian dinosaur from the early Jurassic period. This fossil, approximately 195-million years old and estimated to be seven metres long, has helped scientists to learn more about how early dinosaurs walked. According to Dr Adam Yates, the primary investigator and a palaeontologist at the BPI, this particular species is important as it was close to the common ancestor of the gigantic sauropod dinosaurs. Sauropods, also known as brontosaurs, were the largest backboned animals to walk on land with their long necks, tree-trunk legs and whip-like tails. Aardonyx probably walked on its hind legs, but could also drop onto all fours. There is a large crocodile-like reptile skull, Erythrosuchus, believed to be one of the most distant ancestors of dinosaurs. The showpiece of the collection is the 195-million-year-old clutch of dinosaur eggs – the oldest fossilised dinosaur eggs in the world, discovered in a cliff at the Golden Gate Highlands National Park in the Free State province. This site previously yielded the oldest known embryos belonging to Massospondylus, a relative of sauropods. The discovery of the clutch of eggs, which made international headlines, revealed important clues about the evolution of complex reproductive behaviour in early dinosaurs. Speaking about this discovery in an earlier news report David Evans, curator of Vertebrate Palaeontology at the Royal Ontario Museum, said even though the fossil record of dinosaurs is extensive, there is very little information about their reproductive biology, particularly for early dinosaurs. The newly-discovered dinosaur nesting ground is believed to be more than 100-million years older than previously known nesting sites. At least ten nests have been discovered at several levels at the Golden Gate site, each with up to 34 round eggs in tightly clustered clutches. The distribution of the nests in the rock indicates show that early dinosaurs returned repeatedly to this site, a process known as nesting site fidelity. 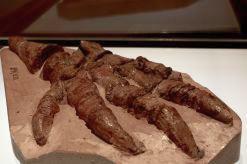 The fossils found in Karoo rock add to the country’s already extraordinary fossil record. “South Africa has had an enormous impact on the field of palaeontology,” Rubidge says. He says there is great potential to develop a palaeotourism route in South Africa, and that there’s no reason why such an initiative couldn’t be as successful as the country’s wine route. South Africa has one of the richest fossil records and collections in the world and the industry could create many jobs. 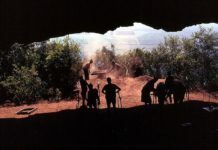 Sites to include on the route include the Cradle of Humankind, where the 2.3-million year-old fossil Australopithecus africanus, known as Mrs Ples, was found in 1947; Nieu-Bethesda’s Kitching Fossil Exploration Centre, famous for its early dinosaur and reptile discoveries; Golden Gate, the site of the oldest fossilised dinosaur eggs in the world, and Langebaan on the West Coast, where fossilised human footprints dating back 117 000 years were found, the oldest known footprints of an anatomically-modern human. Langebaan is home to the West Coast Fossil Park, about 150km northwest of Cape Town, where the oldest woodpecker in Africa was recently discovered and named after former president Nelson Mandela. It lived during the Pliocene era, which extended from about 5.3-million years to 2.6-million years ago. The park contains many well-preserved examples of animals that roamed the land about five million years ago and is described as possibly the most diverse collection of fossils of that age. 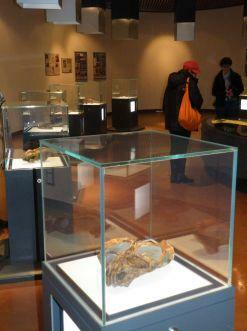 • The fossil display will run until the end of October 2012.